((40p) - Prince Alfred - 1867. Set of 4 values (4v Set) You will be back for more! 3) Select each item and 'Add to Basket'. Tristan da Cunha 2017 Platinum Wedding Anniv 4v umm. Complete UNMOUNTED MINT set of 2 in fine condition. Good condition set of Tristan Da Cunha. It is the 2000, Monarchs set. (Set of 4 values (4v Set): 45p, 55p, £1.30, £2. ==================================================. 3) Select each item and 'Add to Basket'. Tristan da Cunha 2017 Queen Elizabeth II & Prince Philip - Platinum Wedding Anniversary - Mint Never Hinged (MNH). Set of 4 values (4v Set): 25p, 60p, £1, £2. =================================================. TRISTAN DA CUNHA. Value : 20p. Condition : unmounted mint with selvedge attached. Date : 1985. 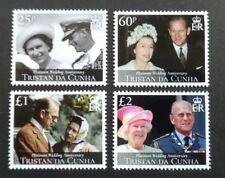 Mint never hinged Tristan da Cunha 2011 Royal Wedding, 1v Sheet: £3. TRISTAN DA CUNHA. Catalogue : SG 514-7. Date : 1991. Condition : unmounted mint. 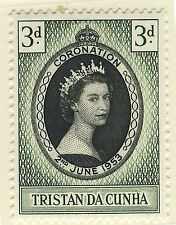 Tristan da Cunha - 1953 Coronation. 2007 Diamond Wedding of Queen & Duke of Edinburgh, set of 4 (878-881) UNMOUNTED MINT Cat £9.00. TRISTAN DA CUNHA. Condition : unmounted mint. Date : 1996. Good condition set of Tristan Da Cunha. 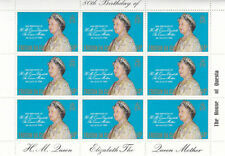 It is the 1999, Queen Mother's Centenary set.